Considering my addiction to books, you'd think all of them were some sort of drug. However, when I find what I consider to be "crack" in the book realm, I don't want to hoard it and instead want to tell everyone how they must read it right away! That is the case with "Neurotically Yours," Bonnie Trachtenberg's second novel. And because I loved it so much, I've even asked her to give away a copy to a lucky reader. However, she instead is offering one paperback (US only) and two e-books! Dara Harrison is a popular and highly respected romantic advice columnist who shares her cynical views with Los Angeles' lovelorn population. However, her new boss doesn't see what everyone else does. This leads her to start a new career, taking what she already knows about romance to start a matchmaking service. It is wildly successful until the day she crosses paths with an angry client who threatens to take her business down. At the same time, she's asked to put her skilled matching services to the test on a popular talk show. Will this be the end of Dara's business? And when she finds love where she least expects it, will it be her own undoing? I could just say I loved this book so much and stop right there. That would be enough, right?!? Really though, once I picked up "Neurotically Yours," I had a difficult time tearing myself away. As soon as I had time to myself, I camped out on the couch until the very last page was turned. I loved the colorful cast of characters that acted as Dara's support system. Her cross-dressing best friend Jesse really sticks out and I could practically hear his voice. Even Dara's cat played a huge role with her healing paws. I liked how I also got to know her potential romantic interest throughout the story, through his perspective. There was so much more to the story than just a woman fighting to keep her business afloat. And you know how much I love entrepreneurial women stories, so this really struck a chord with me. The dialogue was fresh, funny and flowed so nicely from one page to the next. I loved the parts about Dara starting to like a guy and all the excitement that goes into developing a relationship with a potential mate. The story was heartfelt and the interactions between the characters were genuine and moving. There wasn't anything I didn't like about this novel. Having said that though, there was a level of predictability, but I really wanted the outcomes I predicted so it didn't bother me. I felt like Ms. Trachtenberg could have surprised me if she wanted to. I think we just thought too much alike at times, and she created a story I knew I'd be satisfied with by the end. Of course, I didn't want it to end and the ending came quicker than I was hoping for. It could have gone on another hundred pages--or more--and I would have stayed awake that much longer to see what happened. It was everything I want a chick lit novel to have...a strong heroine, a romantic interest that stands for more than just his looks, a nice level of drama and conflict to keep the story flowing and a gay best friend. 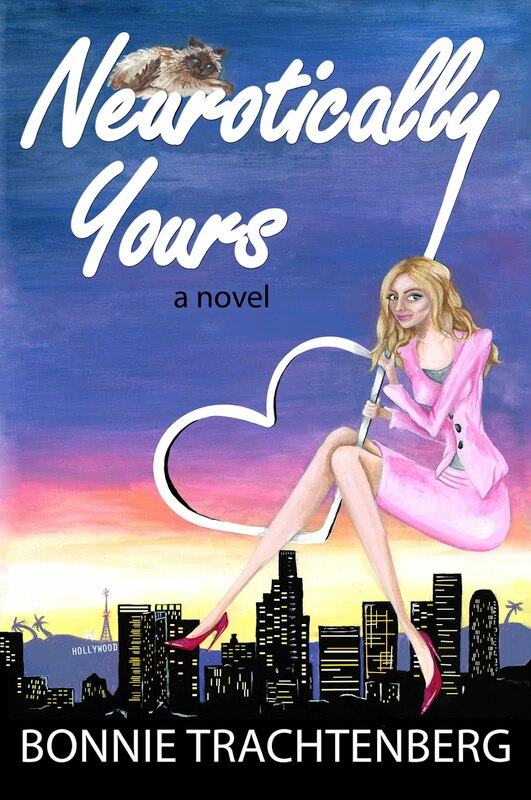 I could see "Neurotically Yours" turning into an adorable chick flick, as long as the film industry kept to the style and mood of the novel. I think Dara would be hard to cast, as she has so many layers to her personality. Sometimes I pictured her as Drew Barrymore and other times as Charlize Theron. There was a bit of Eva Longoria in there too. Ms. Trachtenberg made me want to marry "Wedlocked," which was announced as the winner of the National Indie Excellence award for chick lit. I have a feeling "Neurotically Yours" will be receiving this award next time around and I look forward to whatever Ms. Trachtenberg has in store next. In the meantime, it's only $2.99 for Kindle, or you could try to win it here. Either way, it's a "must read!" Special thanks to Bonnie Trachtenberg for the book in exchange for a fair and honest review, as well as for sharing it with our readers. Please tell us: What kind of love advice would you give to your favorite chick lit character? (One entry per person.) Please leave your e-mail address or another way to reach you if you win. Also, let us know the country where you are located. Paperback is US only. E-books are worldwide. Giveaway ends June 5th at midnight EST. My favorite chick lit character (right now - that list is very fluid) is Harper in Kristan Higgins' My One and Only. I would tell Harper to not suspect the worst in people and to trust her instincts more. I'd also tell her to loosen up, because, well, she needs to. The chick lit heroines generally tend to over analyze things so I would say just go with the flow. Don't sweat it! A favorite chick lit character of mine is Finley Anderson Tanner from Rhonda Pollero's Finley Anderson Tanner mysteries. I would tell her to quit putting up with her mother's crap and just grab Liam by the ears, tell him she's a got a 'thing' that she's got to do and have her classy, naughty way with him already! I'm sold from the review!!! I am the last person to ever give any person, live or character, any advice! :) However I will say "be true to yourself" to all chick-lit heroines! I have no advice. I haven't been in a relationship since the 80s and am happy that way. I guess my advice is you don't really need him. You are fine on your own. I can't pass up a book with this title. It just sounds perfect. One of my many favorite chick lit character is Stephanie Plum - my advice.....marry Ranger! I'm located in the US. I would tell my favorite lit character to dump all the guys who don't treat her right! Hmm...love advice...I guess don't be sad if a guy dumps you. Because you only lost a person that doesn't love you, and he just lost a person that loves him. My advice would be to not buy everything you see. I would advice my favorite chick lit character don't assume things find out what the truth is. I just have some general advice for my favorite chick lit characters: be happy with who you are, and find someone who loves you for who you are! !